We had amazing time meeting everyone who came by our booth in San Diego, CA at the Society of Toxicology's Annual Meeting and we look forward to working with you in the future! With the end of this conference, our team is packing their bags and heading across the United-States to the East Coast where the Experimental Biology conference will be held. For all those located in Boston and the surrounding area, we welcome you to come by our booth #432 and meet our staff. Our team of experts will be happy to show you our equipment and answer all of your questions. Together, our emka & SCIREQ team offers integrated solutions for physiology, pharmacology, and toxicology research. We provide a complete range of innovative instruments and services for in vivo and in vitro research. Our biomedical instruments combine accuracy and reproducibility to provide unparalleled insight into pre-clinical research. 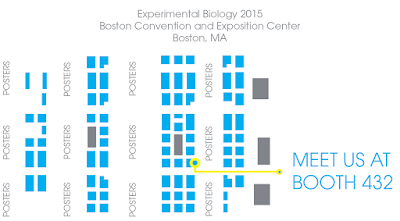 The Experimental Biology annual conference allows us to meet researchers from a variety of disciplines and learn from each other’s work. We look forward to seeing you there and discussing your research interest! Join us at SOT 2015 in San Diego!